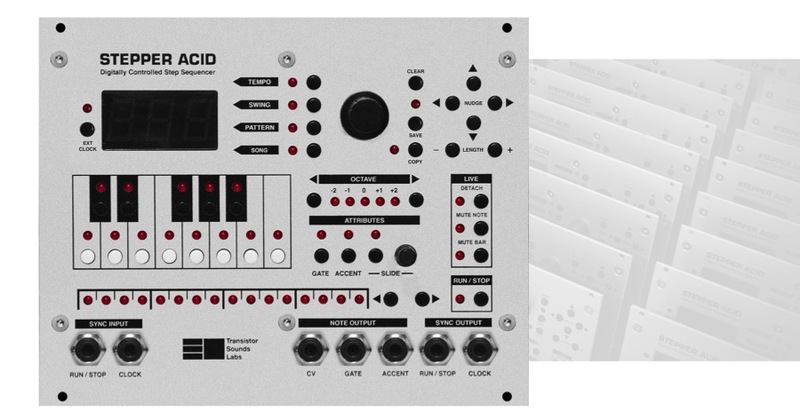 Home / News / Transistor Sounds Labs STEPPER ACID back in stock! Transistor Sounds Labs STEPPER ACID back in stock! The lovely Stepper Acid sequencer from Transistor Sounds Labs is back in stock – Nina & Zoe from TSL have created a winner of a module, bringing sequencing that is at once straightforward, effective, and musical to the Eurorack format. It has a whole host of features, so take a look at its comprehensive MANUAL to get an idea of its capabilities. Previous post: Intellijel RUBICON 2 back in stock! ..plus MORGASMATRON, DIXIE mk2+, DUAL ADSR, SHIFTY, METROPOLIS & more..
Next post: XAOC Devices restock just in – BATUMI, BELGRAD, SAMARA, TALLIN & more..